This idea that God can use children to teach us, that we have an opportunity to gain spiritual insight from those we are called to raise and teach, comes from our Lord himself, who in this regard was something of a revolutionary. In the first century, children enjoyed little esteem and virtually no respect. While families appreciated their own children, society merely tolerated them. The very language of the day reveals this first-century prejudice. One Greek word for child (pais or paidion) also can mean “servant” or “slave.” Yet another (nepios) carries connotations of inexperience, foolishness, and helplessness. Greek philosophers regularly chided a stupid or foolish man by calling him “nepios.” Indeed, even biblical writers admonished Christians to “stop thinking like children [paidia]” (1 Corinthians 14:20). Imagine, then, the people’s astonishment when Jesus brings a troublesome, noisy child and places him in front of the crowd (Matthew 18:1-9). With His hand on the lad’s shoulder, Jesus has the audacity to suggest that this small tyke provides an example to be followed. Jesus seemed to delight in the fact that “inexperienced, simple” children had an understanding superior to the trained adults. Speaking to the crowds in Galilee, Jesus declared, “I praise you, Father, Lord of heaven and earth, because You have hidden these things from the wise and learned, and revealed them to little children. Yes, Father, for this was Your good pleasure” (Matthew 11:25–26). We find the genius of children, spiritually speaking, in their helpless state. The Bible, as well as Christian spirituality, has consistently held pride as the greatest spiritual failing known to humankind. The message of the gospel scandalizes the proud: it insists that we admit we are fallen, helpless, and in need of someone to pay the price on our behalf and then to imbue us with a foreign power so that we can live life the way it was meant to be lived. An infant incarnates this truth perfectly. The process of parenting is one of the most spiritually formative journeys a man and a woman can ever undertake. Unless we are stone-cold spiritually – virtually spiritual corpses – the journey of caring for, raising, training, and loving children will mark us indelibly and powerfully. We cannot be the same people we once were; we will be forever changed, eternally altered. Spiritually speaking, we need to raise children every bit as much as they need us to raise them. 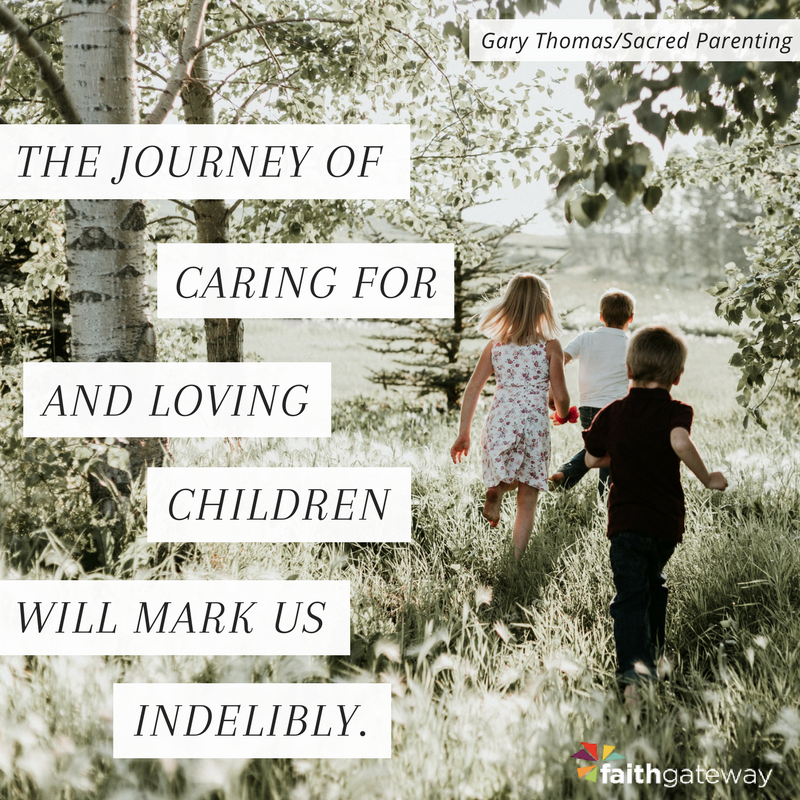 Excerpted with permission from Sacred Parenting by Gary L. Thomas, copyright Zondervan.